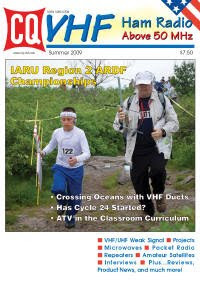 The Tennessee Fire Tower article featuring n4AOW was in the Summer 2009 CQ VHF+ magazine. I need to get me a copy of this... hope they have some at HRO tomorrow! Nice article, Jorge! Thanks for posting. Reading for FUN // SolderSmoke - The Book! Where would Cloud 9 be, if it were a DX entity.